When I first saw the title of this recipe, I wondered how you'd incorporate almond paste into waffle batter. Turns out, you start by warming milk (again, I used milk instead of buttermilk) with some butter. To that warm/hot mixture, add 80 grams of almond paste that's been cut into small pieces so it can more easily break down. Stir the almond paste into the warm milk; to help it dissolve and blend into the liquid, I used a wooden spoon to basically mash the almond paste against the side of the pan. Stir and blend together until most of the almond paste has dissolved. You can continue the recipe in the pan but I choose to transfer the now slightly thickened milk and almond paste mixture to another bowl. I allowed it to cool a bit before whisking in the rest of the ingredients - flour, baking powder, salt, eggs, and for good measure, 1/4 teaspoon of almond extract. The waffle batter rests while the waffle maker heats up. Then just spoon the thick batter into your waffle maker and cook until golden brown to your liking. As I make waffles, I place cooked ones onto a baking sheet set with a wire rack on top and leave them in a 200 degree oven. When it's time to eat, plate the waffles and serve them up! In this case, let everyone enjoy these almond-scented and flavored waffles. Breakfast is special to me, maybe because I'm a morning person and I love the start of a new day of eating! I think it's really important (and nice) to have a good breakfast, especially on the more relaxing weekends. I have to thank this past snow day yesterday for an unexpected treat on a weekday. Place milk and butter into a saucepan and heat over medium-heat until butter melts. Add almond paste and sugar, stirring with a wooden spoon or sturdy rubber spatula until almond paste is mostly dissolved (I stir as well as tilt the pan slightly and mash the almond paste against the side of the pan). Let cool slightly. Add flour, baking powder, salt, eggs, and almond extract. Whisk together until combined. Set the waffle batter (it will be relatively thick) aside for about 10 minutes while the waffle maker heats up. Cook waffles according to manufacturer's instructions. Serve immediately with maple syrup, if desired. They look so lovely golden brown and crisp! Great with a cup of hot chocolate..o man, now I need to go get something to eat! Hello sweetie :) just a very quick visit to wish you the happiest magical Valentine's Day. We are flying today. You know how I LOVE almond paste so these are going on my breakfast menu! They are absolutely beautiful Monica. What a perfect way to start a snow day. All that mess went north of us so we still haven't had a real snow holiday. The trees are starting to bud, crazy weather! Enjoy your weekend and happy baking! Yes, I love our mutual love of almond paste...it's the greatest. ; ) Hope you make this...we enjoyed it...can never get enough of that almond flavor and chew almond paste gives things. We got about 8 inches of snow...nice but also glad when it cleared up around noon yesterday. The sun is out today and I'm very grateful for that. TGIF! Oh Monica I cannot wait to try these! Between the almond paste AND almond extract I'd be in heaven!!! And yay for a snow day! You're right - having plenty of delicious food is important for snow days!! haha Happy Friday! haha - yes!! 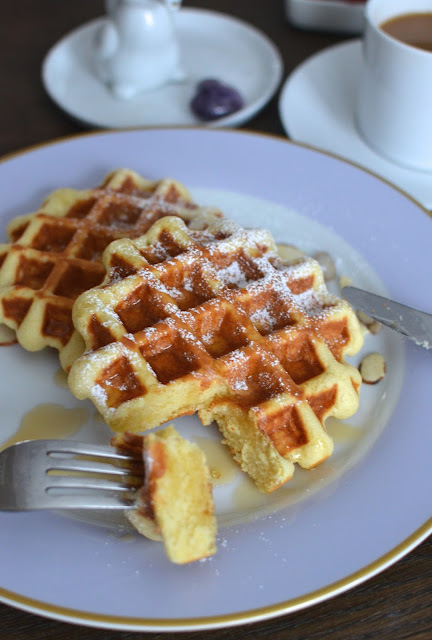 I was so intrigued about the idea of somehow working almond paste into waffle batter! Almond paste and almond extract definitely deserve much love! Hi Monica, what a wonderful looking waffle, love the pic of the inside of the waffle, the texture looks perfect. Wish we had snow days here, I would love to be stranded all day inside with my family. Sounds like heaven. I tried capturing the center better but it was so dark that I didn't get a good focus on the bite. Glad you can tell anyway. :) The inside is fluffy and hearty...and a quite snow day - particularly in the early morning hours - is lovely for sure! I wish we were at your house for breakfast! Love the addition of almond paste in here. Thanks, Bobbi. Breakfast is a special time for me. I'm off to make pancakes! Oh my! I'm definitely happy for the "one" snow day. That's good for now. We keep remember the year we had non-stop snow and looking back, everyone had the winter blues. It was really rough. Hoping you get a break and Spring comes soon! Oh my goodness, these are the the most beautiful and yummiest looking waffles! I LOVE the almond paste and almond extract in here!! I'd love to wake up to these on Valentine's Day and every day after that :) Hope you had a great weekend so far!! Thank you, Kelly. I am thinking a little bit of lemon zest in the batter for you...how good would that be?!! Have a sweet V-Day tomorrow! Mouth watering waffles! I like almond paste a lot but use it mostly for making cookies, I have never had in waffles. I bet they were delicious! I thought it was an awesome way of using almond paste I hadn't tried before as well! They were very good! Oh Monica, I absolutely love the idea of almond paste in the waffles, I too love everything that has almond paste and cannot have enough of it...thanks for the inspiration, I will sure to try this recipe. Wow! 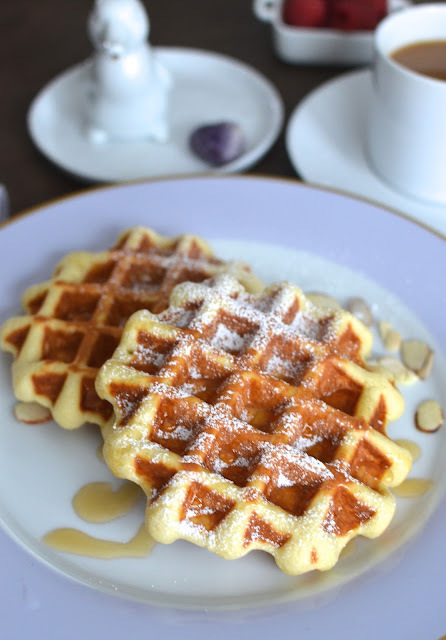 Almond paste in waffles..that would be wonderful. They look amazing. I am yet to have a 'snow-day' in my life. But that wouldn't stop me from making these lovely waffles.